Download full version of VennMaker. Extract the downloaded zip file to your computer. To start VennMaker, you need the current version of Java. The company Kronenwett & Adolphs provides support and training courses for VennMaker. CSV export: When a malformed attribute was used, then the export did not work. Interview mode: Ego questions: If long answer text were used, it happend that the text were not shown. Configuration: If the attribute values of an attributsymbol attribut was deleted, an error occurred sometimes. 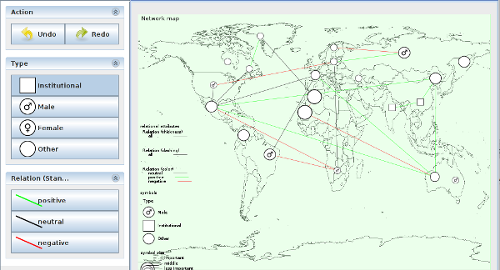 VennMaker Hist Modul: Creating relations with the relation dialog produced an error message. Config dialog: removing attributes caused sometime an error messages. Compute dialog: missing calculation of the frequency of actors per sector and concentric circles repaired. The switch between the questionnaire items did not work correctly. Clicking on the windows close button caused sometimes a save error. If in an interview sectors were used, then this caused an error.